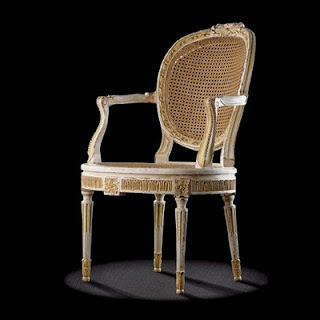 Louis XVI medallion armchair, circa 1775-1780. Dimensions : 97 h x 61 w x 52 d cm. This Antique Louis XVI armchair is slightly different from the previous one, but has sufficient similarities for them to be well-matched. 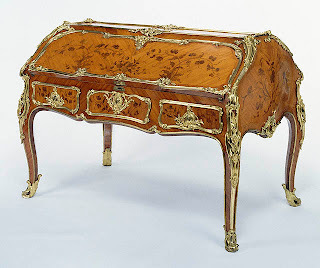 The proportions are slightly different, but the carving is very similar, although it has rather more beads and a rosette at the centre of the rail. 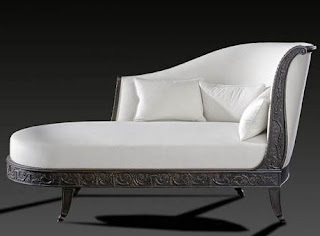 The arm-rests are again in a Louis XV chair "assagi" style, but the armchair itself is constructed a la d’Artois. The high seat makes it suitable for use at antique furniture table.